Of all of horror’s fabled monsters it’s the flesh eating, rigour mortis fuelled undead that have become the most popular and prolific of the genre. The sub-genre has gone from gory simplicity in George A. Romero’s films to sensationalist video game tie-ins of Resident Evil and even showing zombies as a thoughtful lovers as seen in ‘Warm Bodies’. While Zombies have literally been done to death they remain an ever popular phenomenon with AMC’s award winning TV show ‘The Walking Dead’ attesting to their continued relevance. ‘World War Z’, adapted from Max Brook’s epic novel which explores a hypothetical world after being brought to the brink by an unknown zombie epidemic, looks to capitalise on the genre’s continued success and fascination amongst audiences. The film encountered high profile problems during its production including a rewritten ending as well as going an astronomical $170 million over budget, but despite these problems is the attempt to bring zombies to the Hollywood blockbuster stage a success or enough to make you turn in your grave? ‘World War Z’ has a familiar narrative as the world is overtaken by a mystery plague that has turned most of the population into mindless, rapid and violent creatures. The film follows the outbreak from the story of former United Nations worker Gerry Lane (Brad Pitt), who following a close escape in Philadelphia, is forced back into his old job to help an American government in turmoil, desperately needing a solution to the epidemic. Gerry is assigned to a unit who are to scour the globe in search of a cure, with their first stop being South Korea where murmurs of a ‘zombie’ were first heard. Of course Gerry’s mission is far from simple and takes him on a dangerous globetrotting tour in order to find answers. The premise may have been used countless times before but it’s the global scale that is something truly unique about ‘World War Z’ when a majority of the genre is rooted in a personal and provincial level that rarely escalates out of the town or shopping mall its set in. With zombies being projected on a grand scale they are in need of some suitably impressive special effects to make use of the settings, luckily director Marc Forster obliges. Without a doubt the most memorable, innovative and outstanding elements of the film are in the depictions of mass hysteria as the hordes of undead descend on cities. The long panning shots show the enormous scale of the zombie invasion with a chaotic siege of Jerusalem being a highlight with zombies frenziedly clambering over each other to charge the city. While the large scale set pieces are brilliantly crafted the intimate scenes of conflict are lacklustre. Some of the early action sequences with Gerry battling off zombies in an apartment block are so franticly filmed with jerky camerawork that it’s hard to tell what is happening, the dingy setting doesn’t help either. In fact beyond the grand scale and swarming set pieces the film does little to grab the imagination or show anything we haven’t already seen before in every other zombie film. When needed the film does manage to create moments of genuine suspense and palpable tension, but it’s nothing new as we see the usual creeping round dark corridors, fast paced chase sequences and of course the obligatory clumsy incident that sparks the dormant zombies into life just when our hero least expects it. Gerry’s discoveries about the zombie outbreak are as predictable as they are familiar. Efforts have been made to reincarnate the zombie in ‘World War Z’ as they move away from the stereotypical shuffling brain dead variety. Instead what we have here is a hyped up, super-fast, twitchy monster that changes from innocent person to zombie in 10 seconds flat. These zombies heightened mobility adds a few extra scares, also making for a more impressive spectacle in the set pieces, but at the end of the day is just your basic zombie of any horror film before it. The climax is also hugely underwhelming, being something of a damp squib in comparison to the excitement and intensity of the previous hour of action. Being a blockbuster release it must have its customary dose of star power, which in ‘World War Z’’s case lies solely on the shoulders of long haired lead Brad Pitt. With Gerry crossing the world at an alarming rate it leaves little room for any of the supporting cast to make, or leave, a lasting impact beyond their snippets of advice to Gerry. Some notable television actors pop up including ‘In the Thick of It’ star Peter Capaldi as well as a role so small and insignificant for ‘Lost’s Matthew Fox that you wonder why he bothered to take it. There are a few attempts at seeking some genuine connection between characters with little success as Gerry’s family, including wife Mireille Enos, are kept at bay from the action and adventure, limited to a couple of disingenuous phone calls in order to keep the relationship ticking over. When Gerry does find a companion who lasts with him longer than 10 minutes, in the form of Israeli soldier Segen (Daniella Kertesz), she offers an all action, little emotion approach- perhaps indicative of the whole film itself. Brad Pitt does a decent job of carrying the picture, managing to embody his role as an all action man with relative ease but then again the script offers little challenge or need to do any real acting meaning anyone could have taken on the role, Pitt’s inclusion based on star power rather than acting credentials seems to be the case. With ‘World War Z’ director Marc Forster has tried to bring a sense of seriousness to the zombie genre, striving to achieve something not dissimilar to Nolan’s ultra-severe Batman trilogy that took a slightly camp comic book superhero and thrust a sense of gravitas and realism that can be believable in this world. Some of these attempts to bring realism to the zombie genre pay off with an ominous opening collage of ‘real’ news reports on the mystery outbreak bringing a sense of plausibility to the story while a haunting, Omen-esq, soundtrack lurks in the background. Other times the deadly serious tone falls flat with some of the zombies’ close-ups coupled with their erratic body movements making for some accidental comedy. Like most blockbuster releases it’s the special effects and set pieces that are positioned to stand out which is the case for ‘World War Z’. Placing the film on a global scale provides an excellent excuse for some impressive zombie swarms but it also means sacrificing emotional appeal. The success of genre contemporaries ‘The Walking Dead’ and ’28 Days Later’ relies on the small scale they exist on, focusing in on the strained relationships, touch decisions and realistic impact of surviving in a post-apocalyptic world of the living dead. Forster by attempting to make a serious, realistic film has missed the point by abandoning the genuine realism of a smaller scale story. Despite its flaws the film is fairly entertaining and fast moving, with some great action as well as some tense, classical horror sequences that keep you on the edge of your seat. 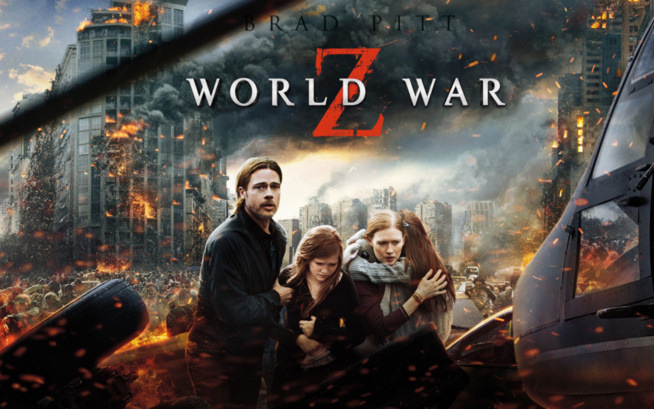 In short ‘World War Z’ is exactly how a zombie film would turn out when produced in the mould of a Hollywood blockbuster release- action and thrills but with little going on below the surface, much like its zombie stars.